Western criticism of Russia's Winter Olympics was reminiscent of Cold War ambitions to hold the Soviet Union back, President Vladimir Putin said on Monday, despite signs that the world was warming to the most expensive Games ever held. The buildup to the Olympics in Sochi on the Black Sea coast has been overshadowed by threats of Islamist militant violence, an international outcry over a contentious ‘anti-gay propaganda’ law and allegations of widespread corruption and profligacy. As the third full day of competition drew to a close, that hostility had begun to melt away and the thrills and spills on snow and ice, and a hugely popular Russian gold in the team figure skating on Sunday, began to win the critics around. Image: Russian President Vladimir Putin walks through the arena after the Flower Ceremony for the Team Figure Skating. The excitement did not stop Putin, who has staked his personal and political prestige on a successful Games, from taking a swipe at his detractors, suggesting he was still smarting from criticism he always maintained was unfair. "Back in Cold War times the theory of containment was created," he told a televised public meeting in Sochi. "This theory and its practice were aimed at restraining the development of the Soviet Union... what we see now are echoes of this containment theory. This, unfortunately, has also applied to the Olympic project. Putin also said the Olympics were playing a ‘positive role’ in relations between Russia and its 2008 war foe Georgia, emphasising that he believed flights set up between Sochi and the Georgian capital Tbilisi should continue after the Games. 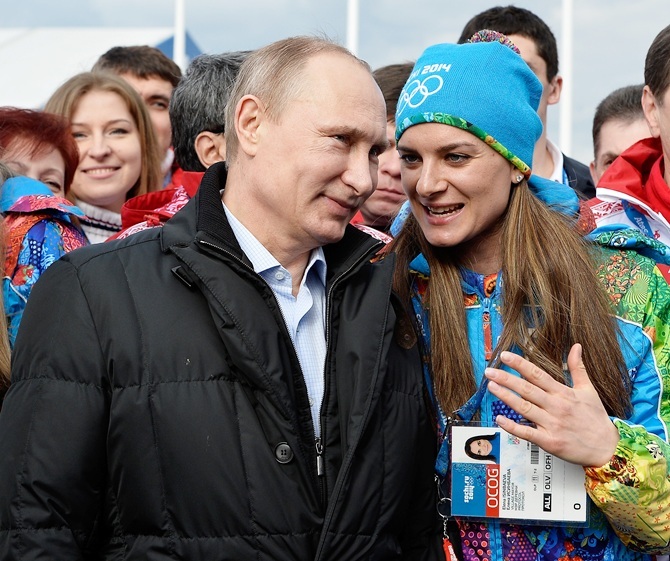 Image: Russian President Vladimir Putin speaks with Olympic Village Mayor Elena Isinbaeva. 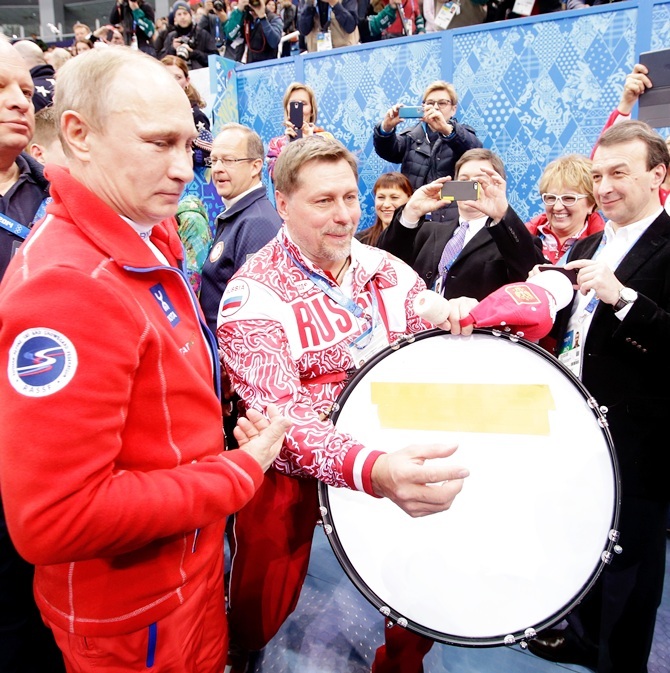 A day earlier, the 61-year-old had been all smiles, as state television captured him congratulating the victorious Russian skaters, "high fiving" with young volunteers, drinking beer and urging the home team to greater sporting glory. On the team was diminutive 15-year-old Julia Lipnitskaya, whose breathtaking performance melted hearts and had commentators in the United States, as well as Russia, gushing over a superstar in the making. "Good job guys, my congratulations to you all," Putin said, addressing the winning team crowded around him. "You have a lot of work ahead of you here, so don't relax." But there were no more gold medals for Russia on Monday. Image: Julia Lipnitskaya of Russia. Monday's biggest drama was undoubtedly in the men's 500 metre speed skating at the Adler Arena, where, in a Dutch sweep of the medals. Michel Mulder beat Jan Smeekens by one hundredth of a second, having initially been announced as second. "It was a kick in the gut," said Smeekens, who thought he had won for about "two or three minutes" before the scoreboard adjusted his time. "I was so ecstatic that I won, I can't describe it." Mulder's twin brother Ronald grabbed bronze as the Dutch continued their dominance of the sport. Image: (From Left) Bronze medalist Ronald Mulder of the Netherlands, gold medallist Michel Mulder of the Netherlands and Silver medalist Jan Smeekens of the Netherlands celebrate on the podium. 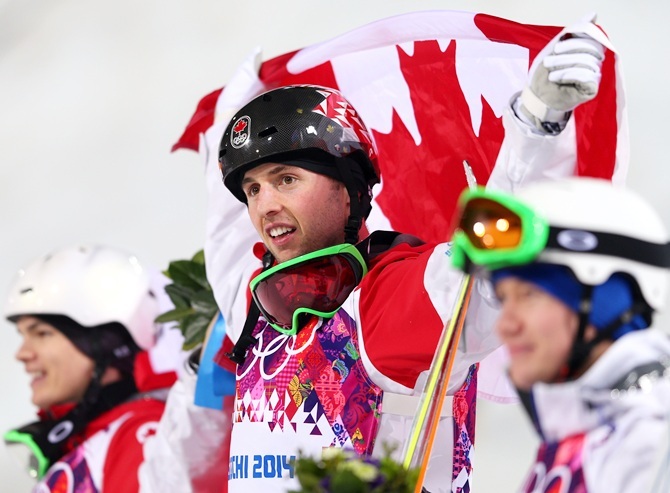 Defending champion Alex Bilodeau led a Canadian one-two in the men's freestyle skiing moguls, putting his country atop the medals table with three golds, three silvers and a bronze. France claimed its first title of the Games when Martin Fourcade won the biathlon 12.5km pursuit. Ole Einar Bjoerndalen of Norway finished fourth to miss out on what would have been a record 13th Winter Games medal. In the high-velocity, notoriously unpredictable sport of short track, Canada's Charles Hamelin grabbed 1,500m gold before lunging over the barriers to wrap his girlfriend and team mate Marianne St-Gelais in a hug. Germany's Maria Hoefl-Riesch retained her Olympic super combined title with a slalom surge amidst the peaks of the Caucasus mountains. In Tuesday's action the first-ever medals in women's ski jumping will be awarded, in the normal hill competition, one of eight golds up for grabs. The American and Canadian heavyweights of the men's ice hockey competition had their first practice on Monday with attention already turning to Saturday's mouthwatering clash between the U.S. and Russia that will bring back memories of the "miracle on ice" at Lake Placid in 1980 when the Americans shocked the dominant Soviets to win 4-3. Image: Gold medalist Alex Bilodeau of Canada, centre, celebrates. A Russian victory in that game would further enhance the mood among locals. Even some of those worst affected by years of disruption caused by huge infrastructure projects in Sochi appear to be won over by the gleaming new Olympic park. "It's just fantastic," Sergei Klyuyev, from the Adler area where the park was built, said as he walked through with his family on Sunday, admiring the state-of-the-art stadiums. "There's been building work here for five years but look at all this around us. We regret nothing, not even the cost." Putin wants to use Russia's first Winter Games, which cost $51 billion to stage, to project the country as a resurgent nation that belongs among the world's elite powers. He has defended the scale of the project, saying it helped shield Russia from the worst of the financial crisis. Not all Russians are convinced, however. A recent survey by independent pollster Levada showed 47 percent of them believe the cost of the Games has soared because funds have been embezzled or mismanaged. Norway, bidding to host the 2022 Winter Olympics, said in Sochi on Monday it would limit its budget to around $5 billion. Included in Russia's eye-watering Winter Games costs is a major security operation, as Islamist militants based in nearby Chechnya and other North Caucasus regions have threatened to launch attacks on Sochi. Some 37,000 security personnel are on high alert in and around Sochi, although officials believe the risk of militant violence is greater elsewhere in Russia. A major attack during the Games would embarrass Putin, who launched a war to crush a rebellion in Chechnya in 1999. Russian police killed four suspected militants in a shootout in Dagestan province, some 600 kilometres (380 miles) from Sochi on the other end of the CaucasusMountain chain, law enforcement officials said on Monday. There was no indication the gun fight on Saturday was connected with the Games. 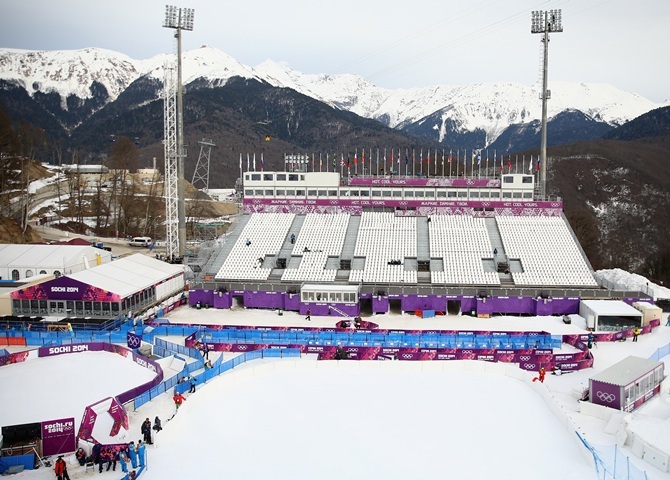 Image: A general view of the grandstand at the Aerials, Half-Pipe and Moguls venue during day two of the Sochi 2014 Winter Olympics. Is Kelly Brook the perfect girlfriend?